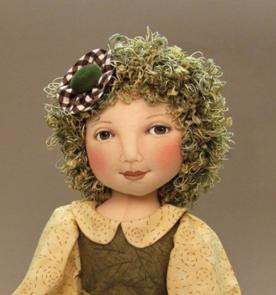 Deanna Hogan works as an ER nurse, and in addition to that she is an accomplished doll artist and doll pattern designer. Deanna's wonderful Alabama Baby inspired pattern captures the essence of the original dolls, while still bringing her own aesthetic into play. I've been watching her doll designs for a long time. I like that she designs modern and antique inspired dolls. That shows versatility and flexibility! You can read more about Deanna's work at her blog. How long have you been making dolls? How long have you been selling them? I really had to do some research to figure this one out. I’m so glad I started a doll journal early on. My first logged dolls were made in 1993. 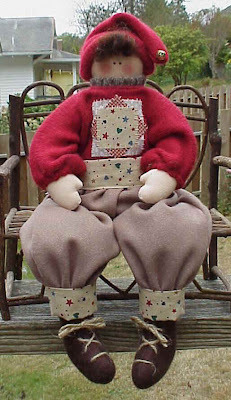 They were simple country dolls, inspired by a Santa pattern I found at the Puyallup Sewing and Stitchery Expo (http://www.sewexpo.com/) I made these dolls with the intention of selling them at craft fairs. 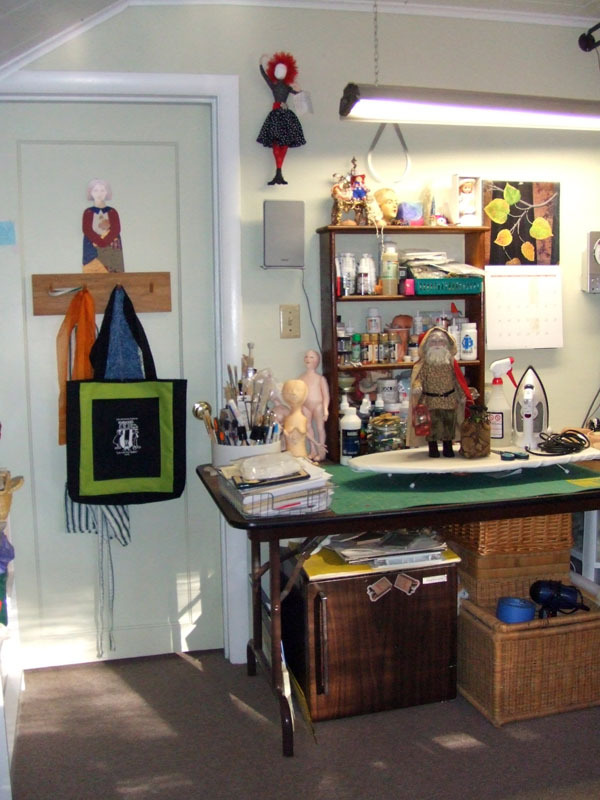 A couple years later, I found that doll maker Judi Ward lived just an hour away. She was teaching classes in her home, so I signed up for one. 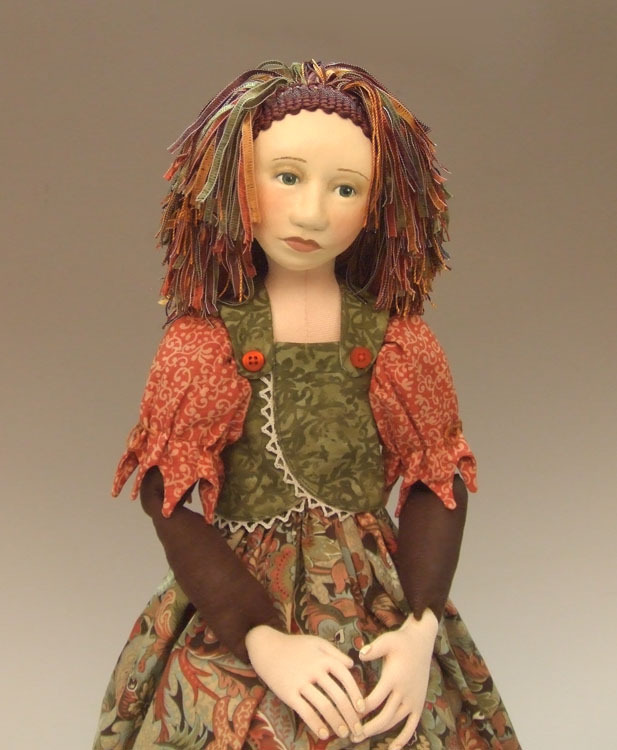 I saw some of her amazing dolls as well as other dolls made by local doll artists. 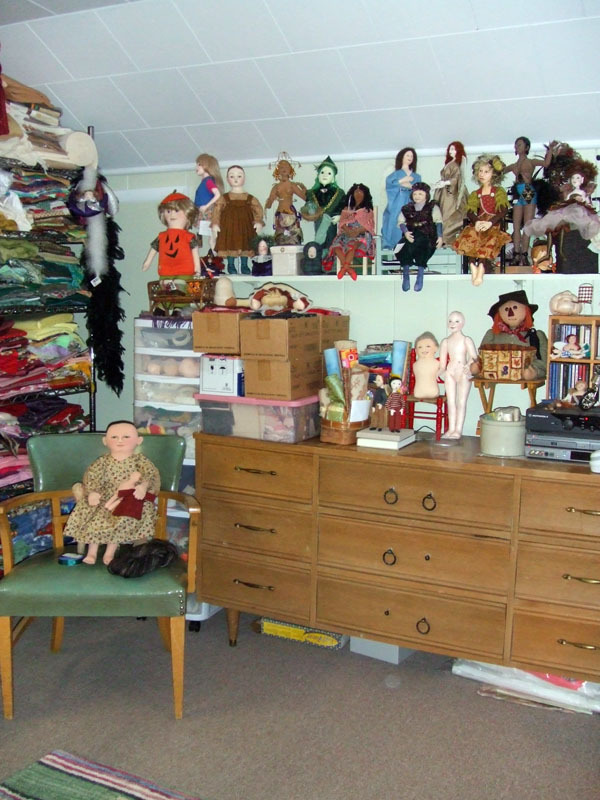 I hadn’t really met any other doll makers. That was such a catalyst for me, and the beginning of my cloth doll pattern and book collection. I think I bought just about everything I could get my hands on, which was the impetus to try my hand at pattern design and publishing. In 2000, a few of us decided to start a doll club. I built a basic website and posted many of our club projects there. 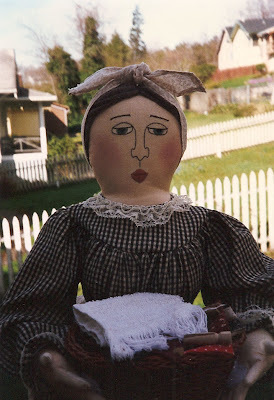 We began selling our dolls at the Crossroads Dolls4All show in Portland, where I was approached to join ODACA (Original Doll Artist Council of America). I became an ODACA artist in 2006. My creative process varies. Sometimes I have a vision in my head, and other times I just start sewing and see how it all turns out. I can’t say I like one method any more than the other, which surprises me as I’m a bit on the Type A/OCD side of the spectrum. My sources of inspiration vary. 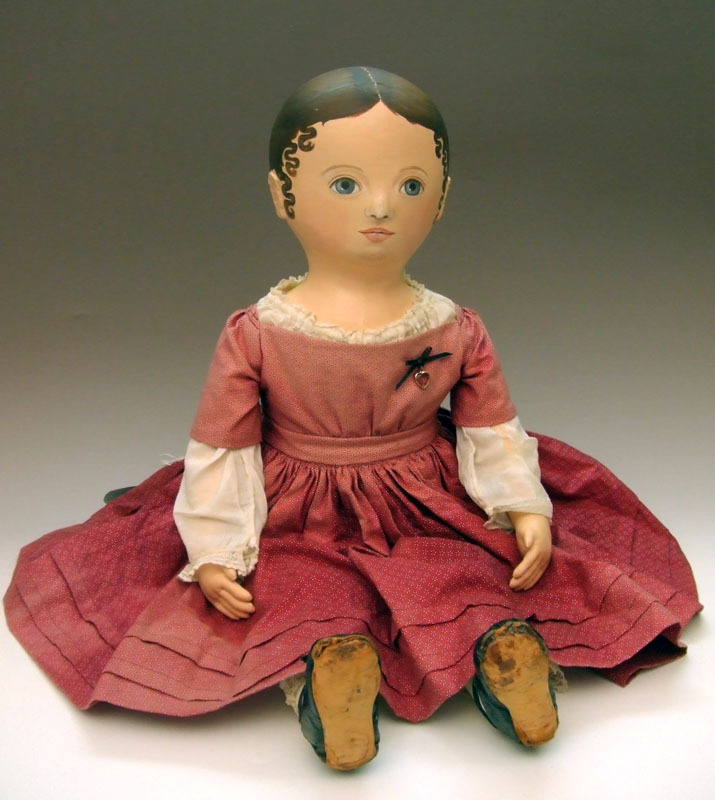 I love exploring the Internet, because there are so many visuals: paintings, others’ dolls, antique dolls, statues, sculptures, etc. Sometimes I do a little research before beginning certain projects. For example, if I wanted to make an angel, I might search the Internet for styles of wings. If I’m stumped for ideas, I start pulling out my doll books and magazines. 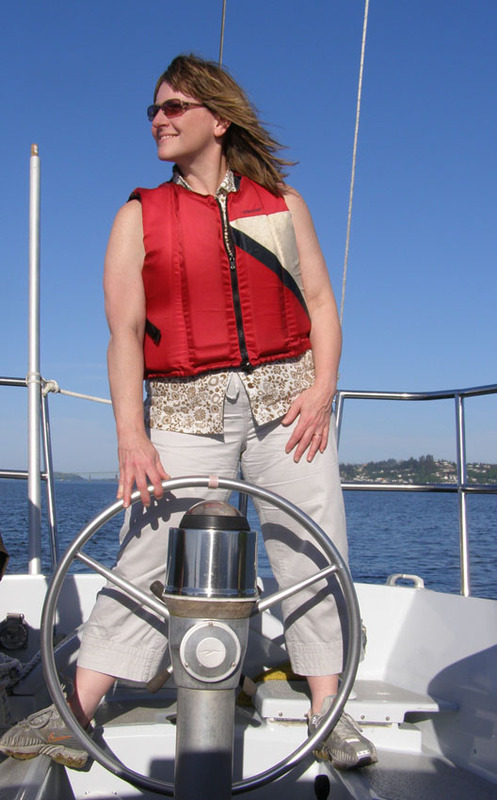 One of my favorite projects and one that was quite challenge, too, was inspired by the carved wooden figureheads of old ships. 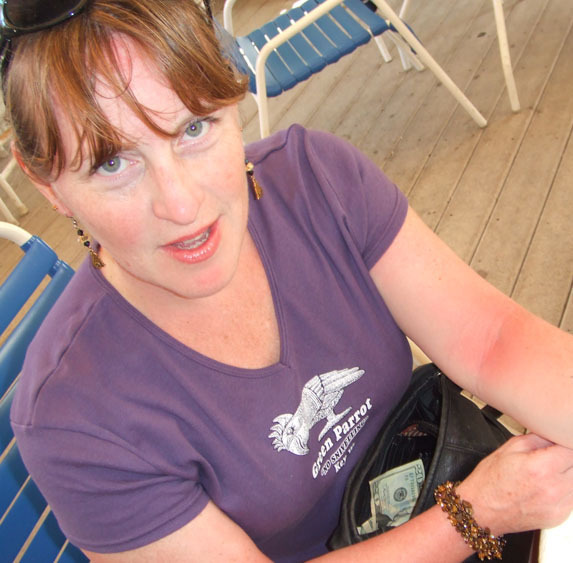 I saw a wooden figurehead over a tavern in Nantucket a few years ago. That got my mind thinking about how I could create something like that in cloth. For this project I made a few sketches, but did my problem solving as I worked. 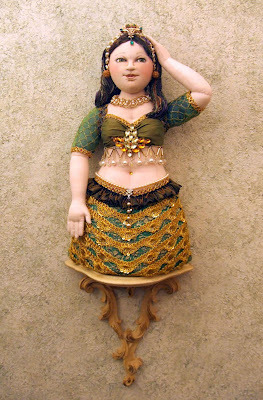 I took progress photos as a record of what I did: (http://www.picturetrail.com/sfx/album/view/17593885) This doll was made for the Treasures of the Gypsy Challenge, so is a bit more embellished than my typical doll. As I gain more experience, I think my dolls turn out more like what I envision in my mind. Early on, the dolls had more control than I did. 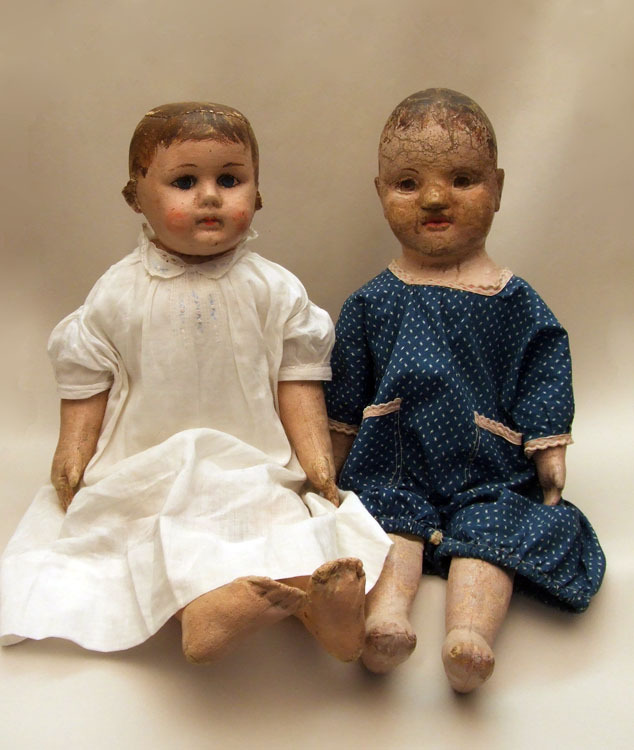 I’ve done some commissioned dolls, which I really don’t enjoy. Two were based on cartoon characters (Reading Man, and Elf Sparkle). I found the projects to be very stifling, and definitely not my style. How has your work changed since you began doll making? How do you see it changing in the future? 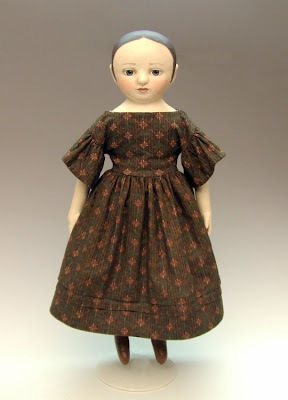 Did you start out making antique inspired dolls, or did you start out making modern dolls? My dolls have definitely changed over the years. 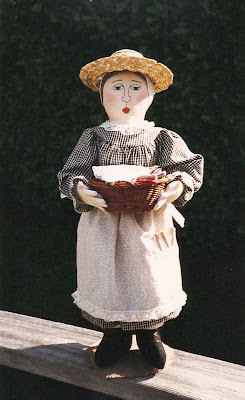 They began as very simple country dolls made from unbleached muslin, to more advanced modern dolls made from knit fabric with lots of detail and needle sculpting. For years, I avoided making dolls of color. 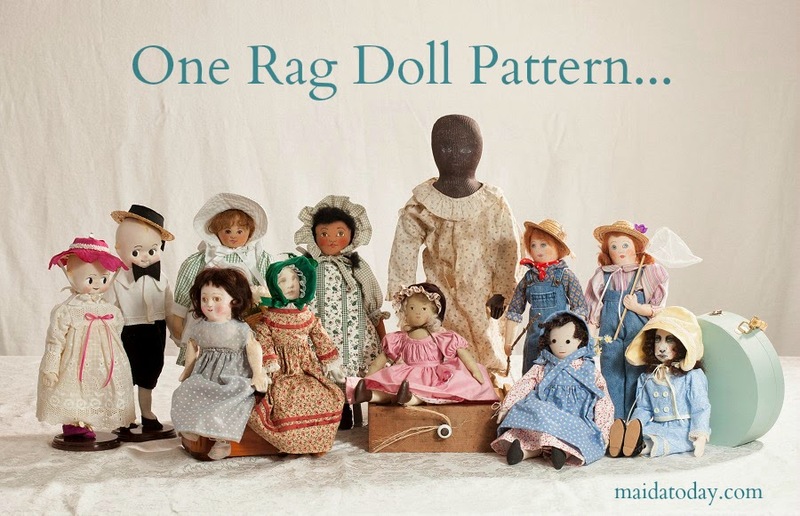 I was afraid of offending, and didn’t want my dolls to look like stereotypical characterizations of people of color. That was one obstacle I’ve overcome. More recently, I’ve enjoyed making antique inspired cloth dolls. I enjoy working with paperclay, too, which gets easier with time, and I love doing cloth-overs. The longer I’ve made dolls, the more I realize there’s really nothing new under the sun. I think it’s funny that “new” techniques frequently turn out to be something done over a hundred years ago. I don’t know what the future will bring. I’ll probably explore more mixed media techniques and continue being inspired by antique dolls. I’m open to all possibilities. 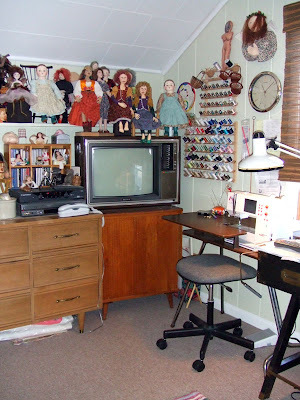 I make my dolls in my upstairs studio, formerly a bedroom. It’s not a huge room, and it’s certainly packed tight. Sometimes I have a hard time finding things. 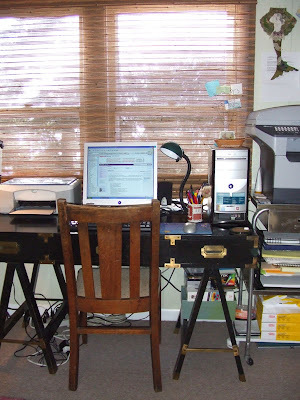 It’s the hottest room in the house in the summer, so do “suffer for my art.” I have a mini fridge under my work table. That’s a remnant from my college days, and a true necessity. I have an industrial wire shelf rack for my fabrics, which have spilled over into bins. I have a large collection of doll books and magazine that I refer to for inspiration. I have a mishmash of furniture rejects. Oh, and you’ll seldom (never?) see the studio this neat – it was staged for these photos. I’ve also got studio “annex,” which is the other upstairs bedroom. Here I keep more *stuff* and leave my photo equipment set up for convenience. Empty Nest Syndrome? I think not. 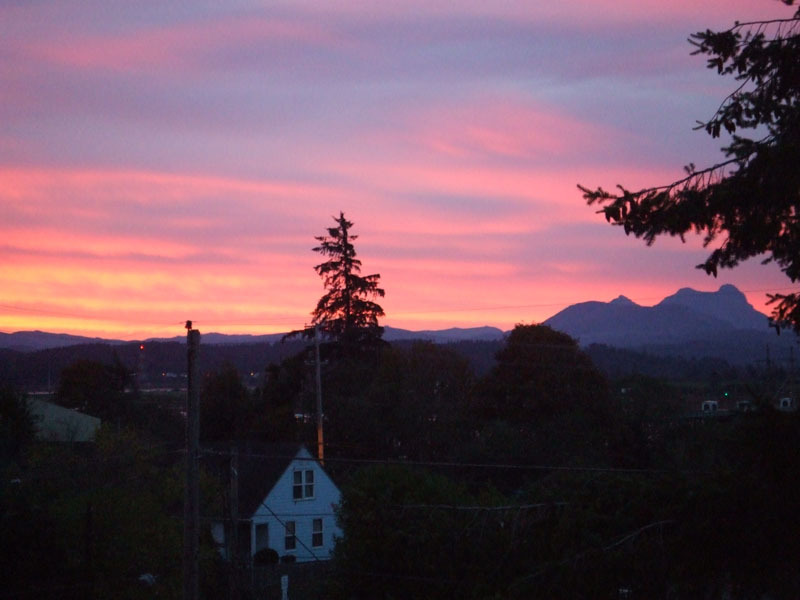 Sunrise out my studio window. 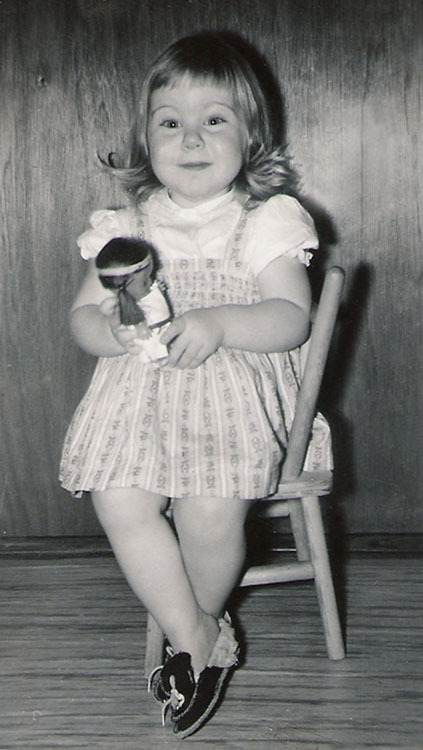 Yes, I’ve always been a doll person. 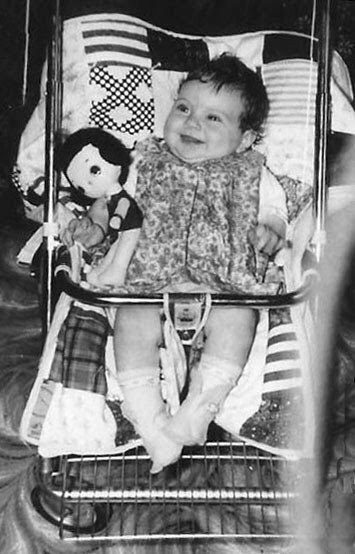 I loved my baby dolls and Barbies. My siblings and I would play together, creating skyscrapers for the Barbie dolls from my brother’s Erector set, complete with elevator. I loved my Baby Tenderlove, Chatty Kathy and Baby First Step. One of my favorites was a doll I called “Betty.” Sadly, the dog stole her while we ate dinner, and probably buried her somewhere in the garden. I don’t remember making dolls, but I made their clothing. I mimicked my mom, who sewed many of our school clothes. When she saw my hand-sewn clothing had details like yokes and separate sleeves, she decided it was time to teach me how to use the sewing machine. I was six. We lived out in the boonies. We rode our bicycles everywhere, strapping our dolls to the handlebars. My sister and I used to hike into the woods and build forts. We’d dig up clay from the bank of the creek behind our house, then take it home and sculpt all sorts of things, letting them air dry. We’d catch crawdads, squealing like the little girls we were whenever the big pinchers got too close. We raised rabbits. We climbed trees. We’d pitch a tent in the yard in the summer when our upstairs bedroom was too hot to tolerate. I took accordion lessons, and every summer I picked strawberries and beans to earn money for school clothes and fun stuff. 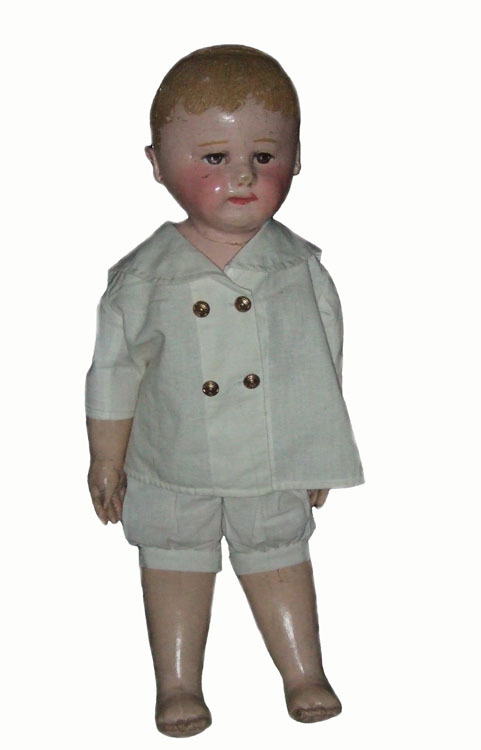 I have a small collection of antique cloth dolls. 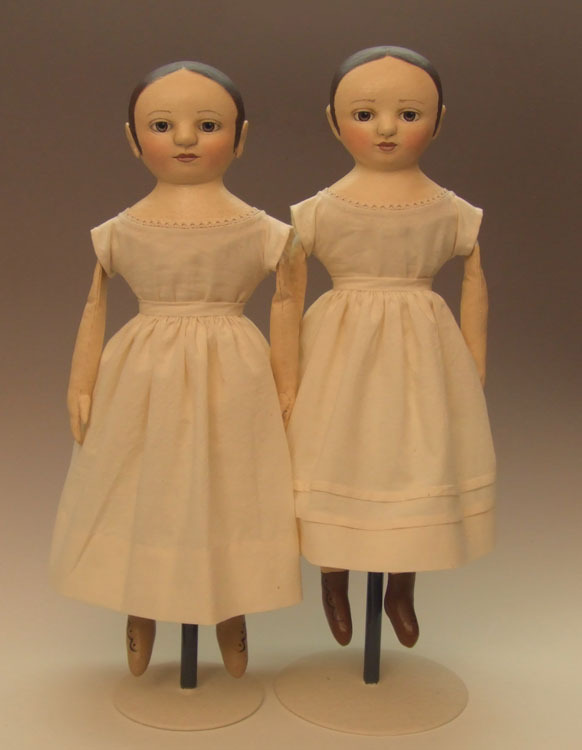 I’ve enjoyed discovering the history of these dolls. My first acquisition was a Chase doll. I saw him at a doll show and kept going back to look at him. The price was reasonable, so I took the plunge. I have a special place in my heart for the Chase dolls, because they are historically connected to the nursing profession (I’m an RN). 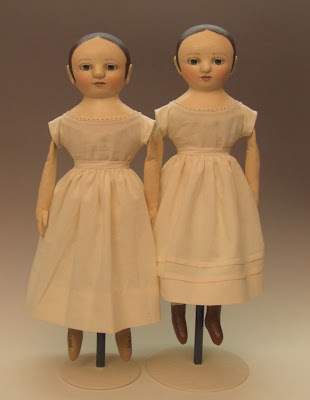 I participated in an Alabama Baby challenge through the Vintage Cloth Dollmaking group, which brought these dolls and their history to my attention. I finally found one I liked on eBay, and was lucky enough to win the auction. I also found a Philadelphia Baby in really rough shape. Her construction differs from the Chase and Alabama Babies. It amazes me that the women of this era maintained profitable businesses and created works of art that are so sought after today. 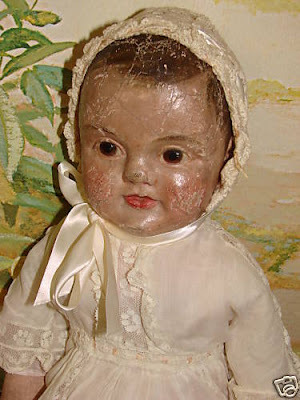 While not antique, I also have a Helen Pringle doll. 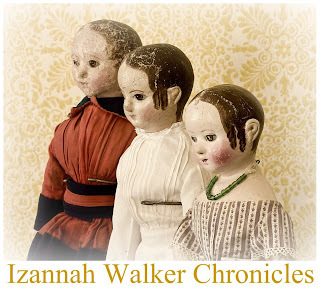 Her dolls are inspired by antique cloth dolls like those made by Izannah Walker. I’m sure I’ll never own a genuine Izannah, but I can dream. Left: My first Chase doll. Right: My Alabama Baby and Philadelphia doll. Right: Another Philadelphia baby, in better condition. Besides making dolls, I have many hobbies. Too many hobbies. 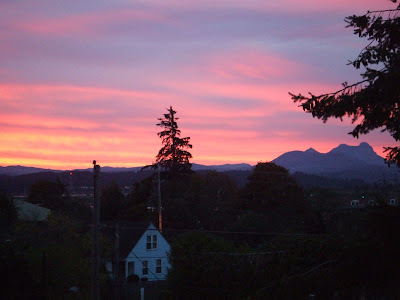 I enjoy bicycling, and have participated in some organized rides over the years: Cycle Oregon (500 miles in a week), Reach the Beach (1-day, 100 mile ride to raise money for the American Heart Association), and the MS 150 (2-day, 175 mile ride to raise money for multiple sclerosis). Now that our weather is improving, it’s time to get back in shape! I enjoy making music. I’ve sung in my college and church choirs and community chorale. I’ve been in several home-grown basement bands (blues/rock and bluegrass), and I like doing on-line karaoke to unwind after work. I play a couple of instruments, but not that well – my husband is the real musician. The fact is, we all learn from each other. We all become better doll makers through sharing of knowledge and techniques. I really enjoyed Dixie’s discussion about making Faithful Reproductions of antique dolls versus making dolls that are Inspired by the Original. We have many different materials at our disposal to use in our doll making today. I’m more of an “inspired by” doll maker. I’m also a methodical worker, and strive to enjoy the process as much as the finished project. Whatever approach taken, I believe strongly that we each must work to the best of our abilities. That doesn’t mean a perfect doll the first time out of the chute. It means not settling for something you know to be not your best work. If you settle, you’ll not be happy with your doll. I find that it’s easiest for me to stay active in my doll making when I’m not overwhelmed by too many responsibilities. I have a busy and stressful career, and sometimes I’m just too tired to be creative when I get home from work. On the other hand, I tend to be more productive when I’ve set goals for myself – but they have to be realistic goals. That means I say “no” to quite a few requests and commissions. I already have a job. I don’t need doll making to become a job, too. Doll making needs to stay fun and fresh. 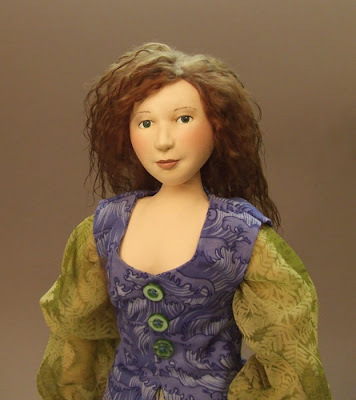 I take classes from various doll makers as a way to stay connected and inspired. I’m not afraid to try new things. So many of us get stuck in our own comfort zones. We’ll never learn anything new if we don’t break out once in a while. I like participating in challenges. This is another way to break out of comfort zones. 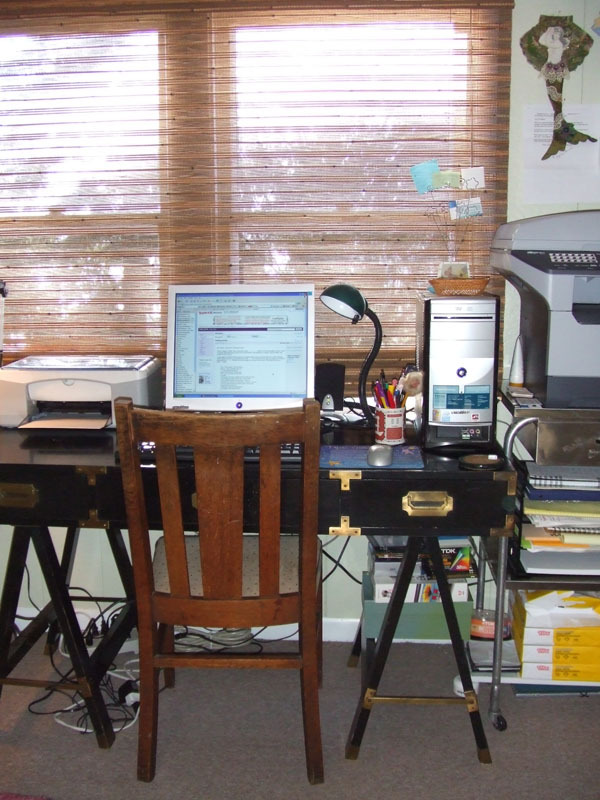 How does inspiration work for you? Sketches, seeing an antique doll that inspires.....? I have many folders on my computer, where I’ve saved photos of just about everything I find inspiring. I’ve printed many of the photos, and keep them in real paper folders, too. It may be a pose, an expression, a costume, that catches my attention. 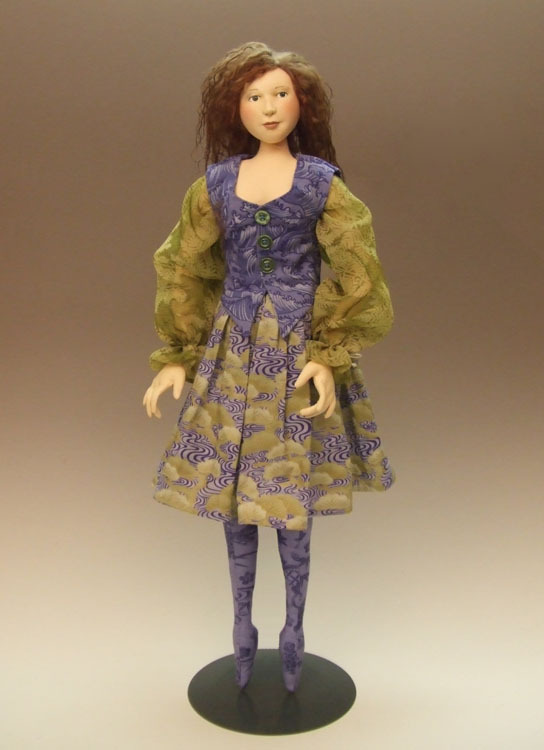 My “Averill” doll and pattern started out as a personal challenge, to select several techniques I’d never tried before, and incorporate them into one doll. The techniques I identified were buried bead joints, knitted eyelash yarn hair, and a molded polymer face covered with knit fabric. 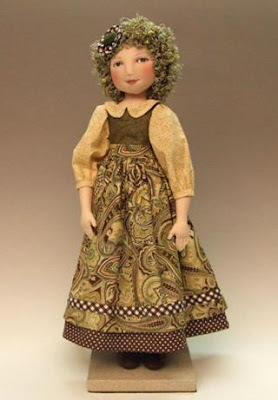 Who are your favorite doll makers? Awesome post! I love Deanna's work, and it's so interesting to see an artist's beginnings morphing into what they are presently creating. I'm in awe of her! Loved reading about you and your dolls Deanna!!!! So interesting! 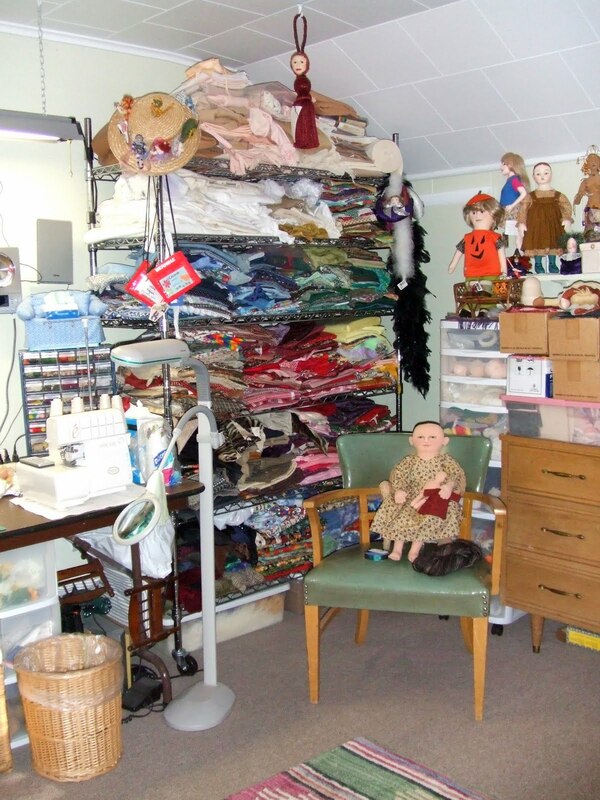 I liked what Deanna said about how the dolls had control over their ultimate outcome when she first started making dolls...I can SO relate to that. I guess you need lots of experience for that to stop happening. My dolls are still controlling me! Wow, What a wonderful artist profile. I too love seeing her humble beginnings and how she has grown to where she is today. I too am in awe of her!! !